has been optimized in the wind tunnel and the C3 Pro becomes a sports helmet which also offers an incredible aerodynamic performance at high speeds. 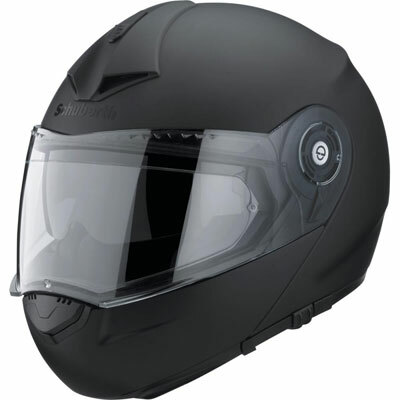 Their sound has also been improved to make it one of the quieter helmets in the world (82 dB at 100 km/h). Like the model C3, it is predisposed to mount the SRC System C3 Pro communication system and incorporates 2 antennas built into the helmet to achieve greater distance communication and FM radio reception. The interior has been used materials like Coolmax, Interpower and the Thermocool to improve even more comfort. Technical details: Outer shell: Made of specially reinforced fiberglass with an array of hard plastic. New way with a small spoiler on the back. Optimizes the aerodynamics of the previous model by more than 8%. More stable at high speeds: no rolling, no lifting effect. Prepared for speeds of + 200 km/h. EPS inner shell: New finish similar to velvet interior. New color. Thicker on the top and back of head. Better absorption of impact thanks to its greater volume. Two antennas: 2 integrated antennas. Optimized for Bluetooth and radio reception. SRCS C3 Pro ready. Top vent: Totally redesigned. 2 tickets to provide a greater flow of air. A 60% increase: from 2.75 to 4.5 l/s. Front vent: Redesigned. New slots that offer a greater circulation of oxygen. Better air flow. Inside: New fabric, the same as using the SR1. Coolmax. Anti-allergic coating. More comfortable thanks to its new shape with fewer seams and termo-soldaduras. Less fabric superimposed on the forehead to minimize pressure. Neck: New mesh ventilation 60% larger. It increases the output of the air. Optimized air flow. 3 new materials. Larger reflective parts for better visibility. Closure of the Chin: Adjustable on both sides. It increases the comfort. New anchor for the cheeks. Lower pressure to the walnut. New buckle like the S2 model. Corta-Vientos (barbillera): new with smaller dimensions. It also offers convenience to users with a head and larger neck. The hard part of the corta-vientos has been changed for your convenience. Solar Viewer: New material; polycarbonate. High optical quality, certified by the Australian standard for solar glasses. New form as in the model S2. Anti-scratch coating. Chin strap: 2 deflection wings for the wind at the bottom. Screen adjustment: Improvements in the framework of the Viewer. Largest seal for better fit. Mechanisms screen: 3 teeth for all screens. Smaller tolerances and better performance. 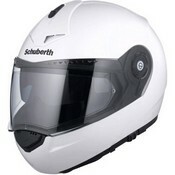 New icon Schuberth on both sides. Aero-acoustic: Only 82 DB(a) at 100 km/h record of Schuberth modular helmets, which makes it in the quieter helmet in the world! Approximate weight: 1570g +/-50 g depending on the size of the helmet. Type-approval: ECE 22-05.